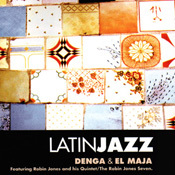 The recordings featured on this CD represent rare examples of Latin Jazz recorded in England where, with the possible exception of Kenny Graham (in the early 50's) there had been little or no Latin Jazz to speak of. However, Latin music had first become popular in England during the 30's with the Rhumba craze that followed worldwide success of 'El Manicero'. This was followed by the samba and conga dances of the 40's. While the music of New York bands lead by Tito Rodriguex, Machito, etc. were known to some in England during the 50's, it had not been as freely available and popular as that typified by George Shearing with his quintet line up. During the 60's, Brazilian music also became very popular through the recordings of Stan Getz and Sergio Mendez. However, until the formation of this band, the UK based Latin ensembles such as those led by Edmondo Ros, Roberto Ingles, although very popular, were only watered-down imitations of Latin Big bands in the US and more often that not, ignored many of the conventions of Latin music. These bands in an attempt to achieve broad popular appeal, favoured Latinised versions of tunes familiar to English audiences.